It's 5 o'clock somewhere is what people often say to justify having a beer before it's actually 5 o'clock. But it looks like it's 5 o'clock nowhere for the brewers of Sam Adams and Budweiser. Boston Beer (SAM), which makes Sam Adams, said in its earnings report late Thursday that volume for its trademark beers fell in the latest quarter. Earnings missed forecasts and the company also issued a weaker outlook. The stock plunged nearly 15% Friday. Overall revenue for Boston Beer was up, but that was more due to the success of the company's non-beer brands, such as the Truly Spiked & Sparkling seltzer, Twisted Tea and Angry Orchard cider. Jim Koch, founder and chairman of Boston Beer, said "Samuel Adams volume has continued to decline" despite the launch of new beers Sam '76 and Samuel Adams New England IPA. He added that Boston Beer will do more marketing to try and boost sales. "We remain positive about the future of craft beer," he said. Wall Street isn't so sure though. The bad news from Boston Beer comes a day after the king of beers, Budweiser owner Anheuser-Busch InBev (BUD), said that US beer sales fell 3.1%. A-B InBev's stock fell 5% Thursday on the news. A-B InBev has made a flurry of deals for smaller craft brewers in the past few years and the company also controls a more than 31% stake in Craft Brew Alliance (BREW), the publicly traded beer company that owns the Kona, Widmer Brothers and Redhook brands. The big beer companies have been increasingly betting on craft beer and microbrews to try and boost growth. But it appears that many drinkers are starting to shun beer in favor of wine as well as whiskey, vodka and other spirits. 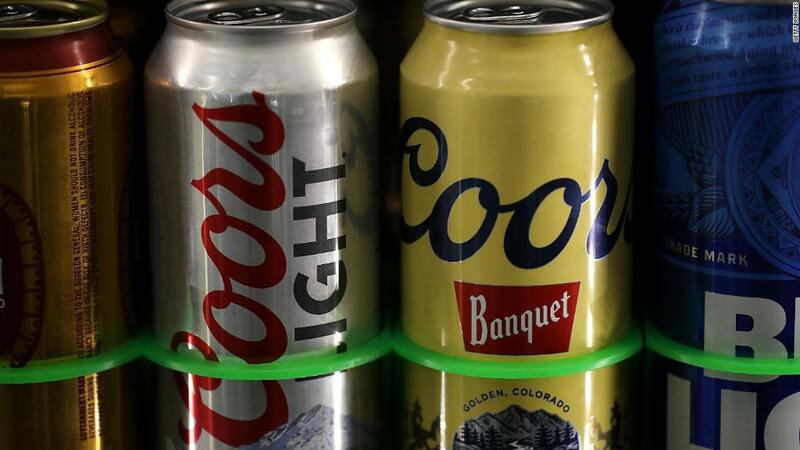 Molson Coors (TAP), the brewer that owns Coors Light, Miller Lite, Molson Canadian and Blue Moon, reported a surprise drop in beer sales back in May. It will release its latest earnings on August 1. Analysts are expecting sales to be flat. There is one company that has so far been able to avoid the US beer slump -- Corona owner Constellation Brands (STZ). Its bet on Mexican cerveza is paying off, handsomely. Constellation said last month that beer sales were up 11% in the most recent quarter.